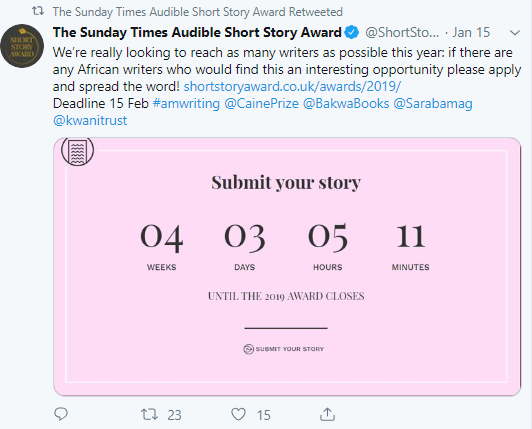 With the announcement in December that Amazon-owned Audible was sponsoring the prestigious Sunday Times Short Story Award came the prospect that the winners would not just earn some extra cash but would have their entries published as an audiobook that would reach a still wider audience. Which all sounds great. The Sunday Times Short Story Award rightly prides itself on its inclusiveness, with a blind jury reading English-language submissions from all over the world. In fact, from every continent except Antarctica. Just this week authors in Africa were invited to submit short stories for the award. But there’s a catch. A rather unpleasant one for authors who have never been published before. Because the eligibility rules require the submitting author to have a track record of being published in the UK or Ireland. Just how many African authors – or authors from other continents – are likely to be able to meet that criteria? But hold on, you might say, This is 2019. As we all know, Amazon has democratised the publishing industry so anyone can self-publish via Amazon’s Kindle Direct Publishing (KDP) service. The snobbery of self-publishing as some kind of third class last resort by authors not good enough to hack it in the real world is a thing of the past. earned more than $50,000, with more than a thousand surpassing $100,000 in royalties. That from the Wall Street Journal just this week. So no question some self-publishers are by any definition professional authors putting out quality content and finding receptive audiences. The stigma of self-publishing is a thing of the past, right? And all thanks to Amazon. Well, no. Actually the stigma of self-publishing as a third-class last resort of the unpublished and the unpublishable is alive and well… at Amazon. You could be forgiven for not realising that when looking at the Sunday Times Audible Short Story Award where any mention of Amazon owning Audible is studiously avoided. And understandably so, because while Amazon is proudly proclaiming its championing of self-publishing, and while Audible itself operates a self-publishing arm, ACX, Audible is happily telling authors that if they self-published their books or short stories then they are third class authors and haven’t been properly published at all. thousands of self-published authors in 2018 earn more than $50,000, with more than a thousand surpassing $100,000 in royalties. But it seems with Amazon that sometimes its right hand doesn’t know what its left hand is doing. because Amazon-owned Audible is telling us unequivocally that, no matter how many books they sold, or how much they earned, an indie author’s self-published works are not worth a light. Don’t take my word for it. It’s right there in item 3.6 of the terms and conditions of the Sunday Times Audible Short Story Award. Bold highlights are mine. The words are those of the Sunday Times and Amazon-owned Audible. Let’s leave aside that condition 3.6.3.6 directly contradicts the primary condition. At which point, let’s get briefly personal. In 2011 one of my works of prose fiction topped the UK charts, not least on Amazon. Quite aside from being the eleventh best-selling ebook in the UK, according to The Bookseller, my book topped the Kindle UK charts for several months. It went on to top the charts in France and China (in fact the first western indie-published book to reach number one on Kindle China). Amazon briefly published the book on its own site for the 5th anniversary Kindle UK celebration, as one of its top-selling Kindle UK titles. Yet according to Amazon-owned Audible this, and the achievements of those “thousands of self-published authors in 2018 (that earned) more than $50,000, with more than a thousand surpassing $100,000 in royalties,” does not constitute a record of prior publication. Audible didn’t tell you this. They are only the sponsor, not the ones running the contest. By definition if Amazon sponsors something and has its name on it then it is party to whatever is in the rules and by definition agrees with those rules.